A lovely pile of Christmasness! Hello, hope that you are all well and happy. I have been busy taking pics of all the things that I have made for the Craft Fair the weekend after next so thought that I would share them all with you. Have probably about 60 things to sell in total which I think is a good amount and all apart from the baubles are my very own designs so I am even more pleased with those! 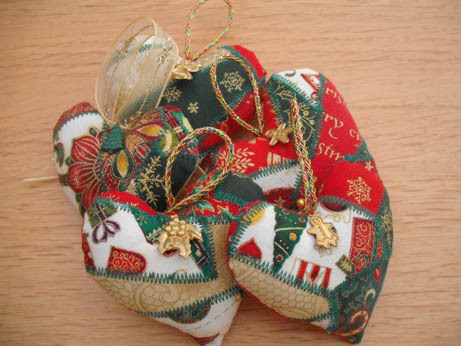 First up come the patchwork hearts – have about 20 of these and I love them, any that don’t sell are going on the tree! Then the little stockings – similar to the hearts but these are not patchwork – same fabric in different colourways back and front. The fronts are all the same, the backs all different fabrics. Then some bags using a Makower label fabric that I have had in my stash for quite a while. And lastly this bag set that uses fabric that I have carbon dated (ie. looked back at my blog!) to being in my stash for 4 years! And there is still more where this came from. Then there are my old faves the baubles – designs taken from Sue Schofield’s, ‘Decorations to Dazzle’ ,available from Springwood House Designs. Buy this book – have fun and impress your friends just as I have been doing for the last four years. And she is such a lovely woman and has all sorts of other ideas as well as baubles, she is a Christmas ornie genius! We have one with some cute reindeer buttons on. And some made with the angel fabric that Kerry gave me last week.These have little gold cross charms on the sides you can’t see in the pic. And a set of gold ones – again partly from fabric donated by Kerry – stitching friends are the best kinds aren’t they? Love these as I have been able to use up cute snowflake buttons bought in May at the Malvern Quilt Show. The really good thing is that if none of this sells I will just have a very pretty house and tree this year! If though all goes according to plan and the stock whizzes off the table I still have all the stuff I have done for me. This year apart from a baby gift and a couple of exchanges all of my cross stitch work has been ornies for me and this is my collection so far. I did want to do one a month so that I had 12 more for the tree this year, there are only 9 in the bowl but I sent one off to my last exchange partner with her autumn exchange, have this week finished another and have a just completed WIP that needs stuffing and backing. So that does make 12 done but only 11 still in the country so will have to get cracking to get that final one done before the tree goes up in 3 weeks! Here is a pic of the finish for this week. This may well be one of the smallest ornies ever made – here it is next to my thumb. I think it is 28 count fabric and it was very quick to stitch – if at times a bit of a challenge to see! Another one of the JBW Designs stockings. Hope that you are well on your way with all your seasonal preparations. I do love the run up to Christmas, I have been buying nice food and as usual most of my pressies have been bought for ages so I can concentrate on the serious stuff of decorating the house and doing bits of baking with the kids. We are going to be away for Christmas this year again which will be very exciting as we are going to Disneyland Paris – as regular readers know we are huge Disney fans and this will be our 5th visit to the Paris one (over the last 14 years) and are very much looking forward to spending the time in the Magic Kingdom with Mickey and co – have just been looking at all the lovely shows and parades that are on and getting very excited! We are very lucky people! Anyway I will leave you with my best wishes for your preparations for the festive season and will see you all again next week with a report on how the Craft Fair went – wish me luck! I love it when a stash comes together! 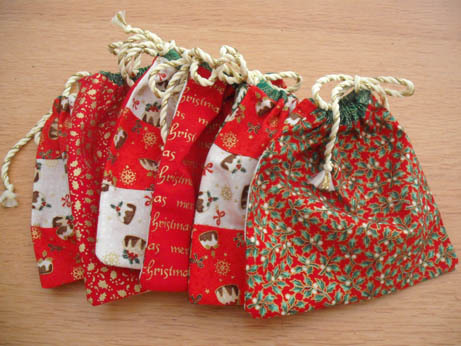 The Craft Fair and a little more Xmas fabric! What time does the the craft fair open? Think it is 10am – will be lovely to see you. Holy Cow — that stocking is tiny — and just too cute! Looks like you’re ready — and all with lots of run stuff. GOOD LUCK!!! I know, did not realise that the fabric was that high a count – that one really strained my eyes to do! It is a very cute ornie though. Have just finished another stitch on the same fabric but used the magnifier for quite a bit of it – especially when stitching in the evening when light is not good. I am very pleased I have managed to make so much stock, just getting my labels and display stuff ready now and I am good to go. Ellie is coming home on Weds and she is coming with me so that will be lovely.